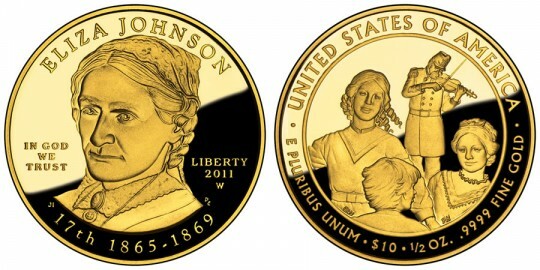 The Eliza Johnson First Spouse Gold Coin will appear as the first strike in the series from the US Mint in 2011. The coin also marks the 18th for the series as a whole which started in 2007. This series of coins honors the spouses of the former Presidents of the United States. Each is honored in the order upon which they served with this strike of Eliza Johnson tied to the administration of her husband, Andrew Johnson who was the 17th President. Eliza moved to the White House when her husband assumed the office of President upon the assassination of President Abraham Lincoln. She remained there for the next four years although she did not typically fulfill the duties of White House hostess owing to her health. In fact, she made only two public appearances during this time. The first at a reception to welcome Queen Emma from the Kingdom of Hawaii and the second at her husband's birthday party in 1867. 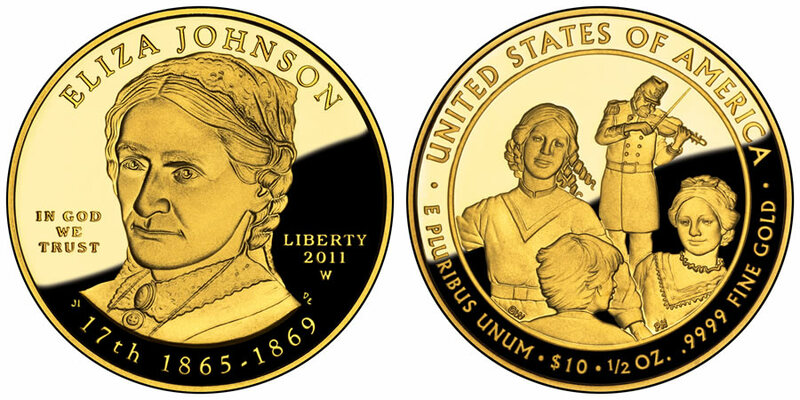 The United States Mint actually strikes two versions of this coin - the Eliza Johnson First Spouse Gold Proof Coin and the Eliza Johnson First Spouse Gold Uncirculated Coin. Both contain the same designs, but feature different finishes. The obverse of the coin should contain a portrait of Eliza Johnson along with the inscriptions of "ELIZA JOHNSON, " "IN GOD WE TRUST", "LIBERTY", "2011", "17th" and "1865-1869". The reverse will showcase a scene from the life of Eliza along with the inscriptions of "UNITED STATES OF AMERICA", "E PLURIBUS UNUM", "$10", "1/2 OZ. ", and ".9999 PURE GOLD".